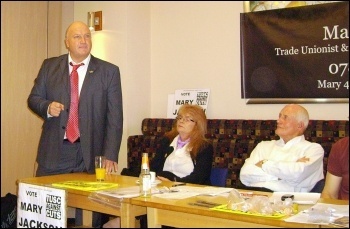 IDS - Try living on £53 a week! 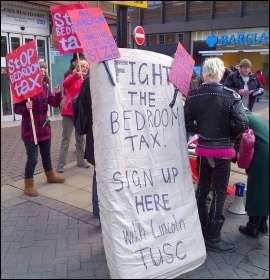 Lincoln: No Bedroom Tax evictions! Don't miss May Day greetings deadline! 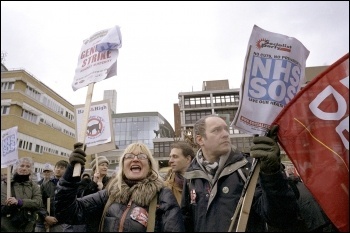 The deadline for sending May Day greeting messages to the Socialist - 10 April - is approaching fast, writes Bob Severn. 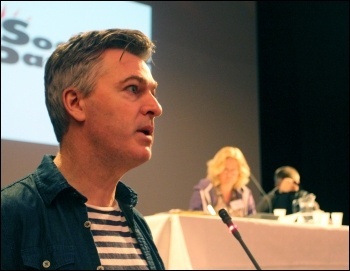 Socialist Party members have begun 2013 in the way they finished 2012 - by continuing the fight against the attacks of the Con-Dem government and, in the process, continuing to smash the fighting fund targets, writes Ken Douglas, Socialist Party national treasurer. On Friday 3 July 2009, a devastating fire in Lakanal House in Camberwell, south London killed three women and three children, writes David Lewis, Sceaux Gardens tenants' and residents' association. 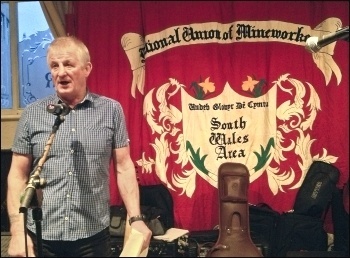 Over 40 people crammed into Housmans Bookshop in north London on 27 March to hear a debate between the Socialist Party's Pete Dickenson and Derek Wall from the Green Party, writes Neil Cafferky. 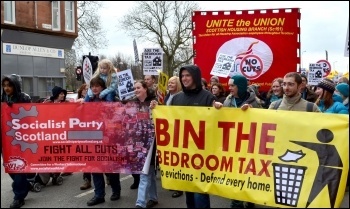 Over 5,000 people from across west Scotland and beyond marched in Glasgow on Saturday 30 March against the bedroom tax but also against the impact of savage austerity in all its forms, writes Matt Dobson, Socialist Party Scotland. 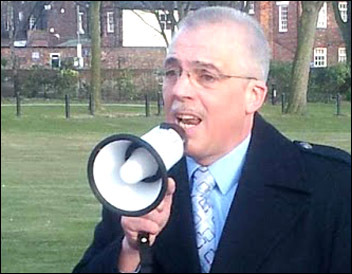 Thera East Midlands: Joe Warner, the (now former) managing director of Thera East Midlands has resigned. 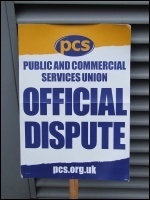 Unison members who are in dispute with the company had been wondering where he was! 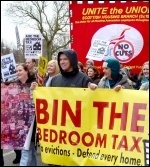 Bedroom tax: Can't pay - determined to stay! 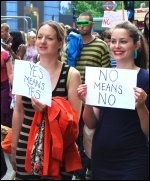 "No nos vamos, nos echan" - we're not leaving, we're being thrown out. This was the message of hundreds of young Spanish people on a protest in central London on 7 April, writes Sarah Wrack. 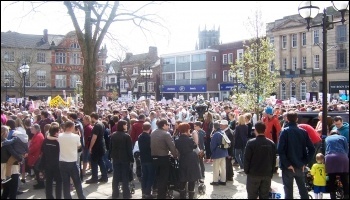 Saturday 6 April saw around 300 people march through the centre of Cheltenham, Gloucestershire, against plans to reduce night time staffing at the town's A&E, writes Gregory Mouat, Gloucestershire Socialist Party. The 2012 staff survey results from the Sussex Partnership NHS Foundation Trust are even worse than the previous year's results, which were grim enough, writes Sharon Mitchell, Brighton. 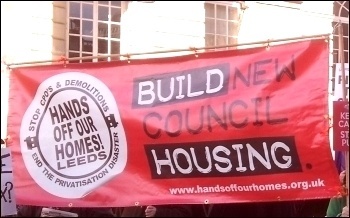 HBOS has been called the 'worst bank ever' after colossal losses resulted in a government-brokered merger with Lloyds and a subsequent taxpayer bailout of £20.5 billion, writes Matt Gordon, Bristol Socialist Party. 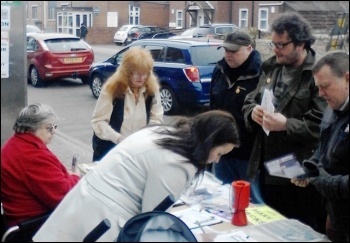 An advice worker explains what life on benefits is really like..
Vote for Socialist Party and United Left candidates. 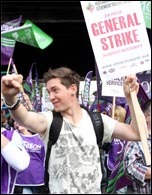 Elections for Unison's national executive (NEC) start on 22 April and run until 24 May. 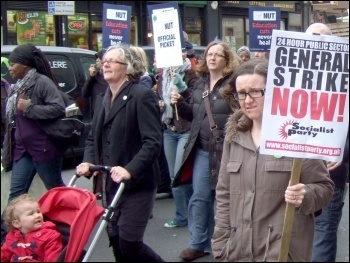 Halt the Thatcherite onslaught - TUC must call a 24-hour general strike! The bombings today at the Boston Marathon are an absolute tragedy and a horror that shouldn't happen in Boston or anywhere else in the world, writes Reposted from Socialist Alternative in the USA, sister party of the Socialist Party, posted. Apr 15, 2013. Waiting for Labour leader Ed Miliband to arrive in Stroud as part of his whistle stop election tour of the South West, one person asked which direction he was coming, writes Chris Moore, Gloucestershire Socialist Party. 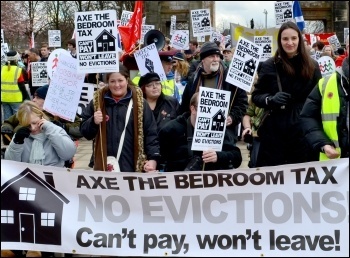 Feature: Fifty anti-cuts campaigners and bedroom tax victims lobbied to demand the council re-classify homes as having fewer bedrooms and commits to no evictions for rent arrears as a result of the bedroom tax. Reports from around the country. 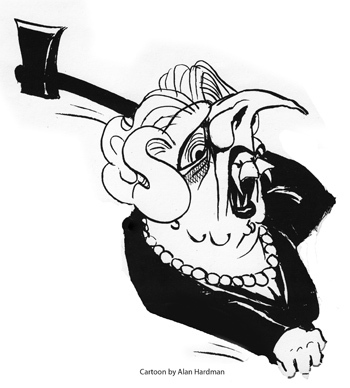 Support the paper that beat Thatcher - twice! 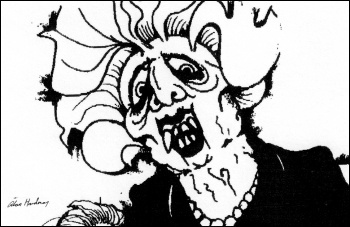 Readers of the Socialist will have been sickened by the acres of newsprint and hours of television that have been devoted to worshipping Margaret Thatcher and her record, writes Ken Douglas, Socialist Party national treasurer. Ed Miliband said, at Labour Party Wales Conference, that he wants the shadow cabinet to come to Wales and learn from the good things that the Welsh Government is doing, writes Ronnie Job. 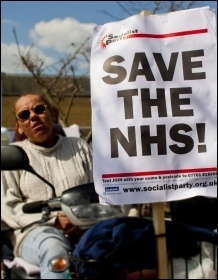 Defend our health service: Last autumn it emerged that 120 breast cancer test errors had happened between 2004 and 2010 at Kings Mill Hospital in Mansfield, Nottinghamshire, writes Karen Seymour, Mansfield Socialist Party. 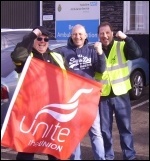 After an 82% vote for strike action, Unison members in Thera East Midlands (TEM) will be on a 24-hour strike starting on 18 April. 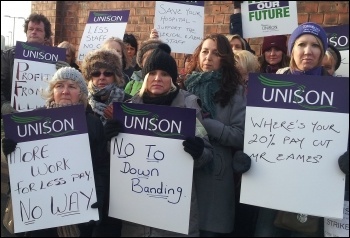 The ballot also gives leeway for further strikes if necessary, writes Gary Freeman, Unison Rep, South Derbyshire Healthcare, personal capacity. 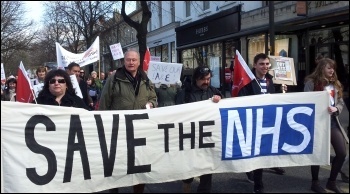 Saturday 20 April will see the march against NHS cuts in Dewsbury (previously postponed because of snow) take place at 12pm outside the Town Hall. 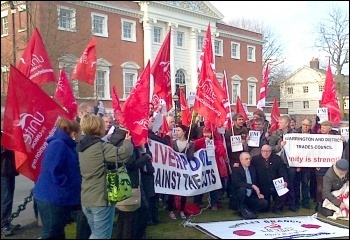 Following on from the 4 April demonstration outside the disciplinary hearing of rebel Labour councillor Kevin Bennett, a joint meeting of Warrington Trades Council and the newly formed Warrington Against the Cuts was held on 10 April. 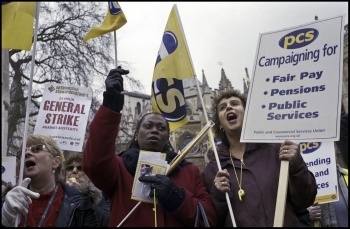 Say to the TUC: Fight back! 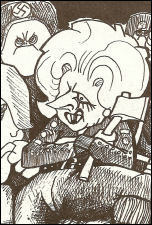 Peter Taaffe, Socialist Party general secretary, said: "The news that Margaret Thatcher is to receive a ceremonial funeral subsidised by the taxpayer is an insult"
No ifs, no buts...: The death of Thatcher has revealed the deep class polarisation that existed under her governments and still exists in British society, writes Rob Williams, Socialist Party industrial organiser. 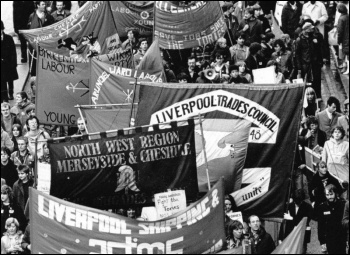 An open letter responding to an article by the Independent's Jane Merrick, from Tony Mulhearn, surcharged Liverpool City Councillor and last elected president of the Liverpool District Labour Party. 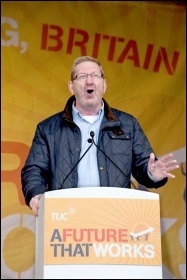 The victory of Len McCluskey in the Unite general secretary election with 64.4% of the vote against fellow left-winger Jerry Hicks will be seen by the union's membership as ratifying the general direction of Unite since Len first took the position in 2011, writes Kevin Parslow, Unite London and Eastern regional committee, personal capacity. 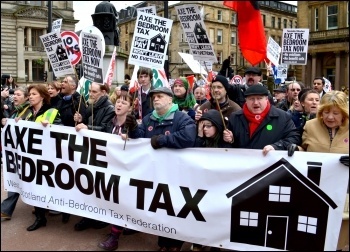 How our campaign can win: To charge tenants who are already on low incomes for having a room where people they are close to can stay is just about the meanest trick of a government which has a world-class reputation for mean tricks, writes Paul Gerrard, Salford against Cuts. First steps toward uniting struggles: Following the launch of the new Workers and Socialist Party (WASP) on 21 March, work is continuing to complete the formal registration of the party and establish its structures across South Africa, writes Liv Shange, DSM South Africa. 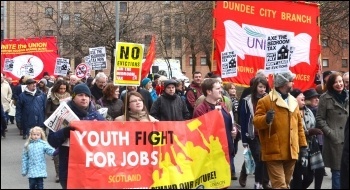 The Scottish Trade Union Congress (STUC) has passed a motion in support of a one-day general strike in Scotland in response to the savage austerity being carried out by the Con-Dem government, writes Philip Stott. 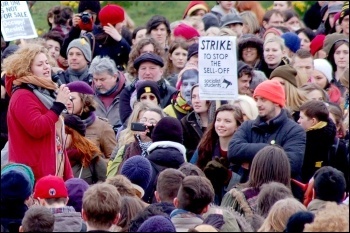 Hundreds protested outside parliament on 14 April to demand the outlawing of caste oppression in Britain, writes Senan, Tamil Solidarity international coordinator. I live in rural Derbyshire. We have a couple of large outbuildings and young homeless men often shelter in them, writes Sandy. 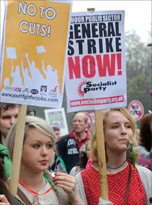 Socialist Students is celebrating an excellent result in the NUS 'Block of 15' elections. 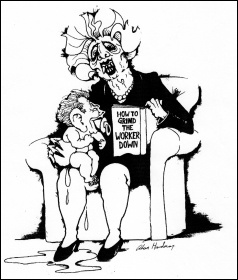 "We are all Thatcherites now," declared Tory leader David Cameron on the day of Thatcher's funeral. 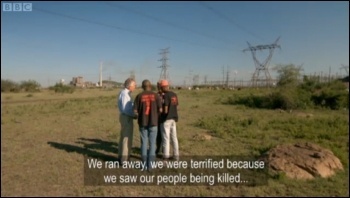 "Oh no, we're not!" 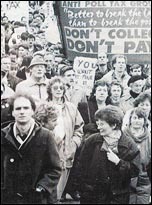 roared back the working class in Goldthorpe, where over 1,000 protested, in Liverpool, Glasgow and London. 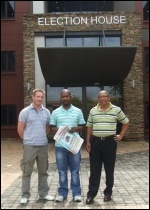 Feature by Peter Taaffe, Socialist Party general secretary. 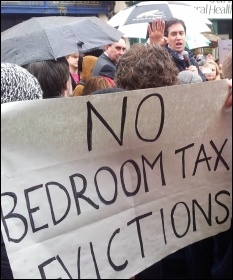 Stop the bedroom tax - Hands off our homes! Politicians keep inviting us to feel sorry for them as they have to make tough choices - choices of whose jobs, whose terms and conditions, whose services to cut. That's not a tough choice as far as we're concerned. 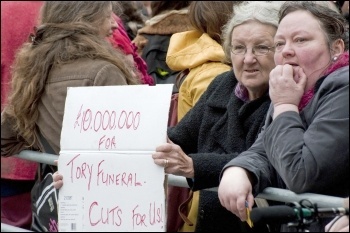 If you represent working class people you don't make cuts. 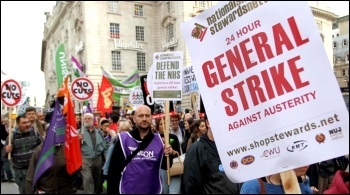 TUC: Set the date for a 24-hour general strike! 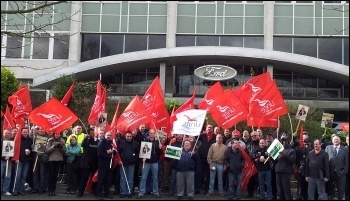 A lively picket of 30 teachers gathered at the gates of Hamstead Hall secondary school in Birmingham on Thursday 25th April as part of a one day strike against management bulldozing through plans to become an academy, writes Nick Hart, Birmingham Socialist Party.